If like me you are a Mac user but an avid hater of iTunes, you may be pleased to read that you can get around the whole iTunes image backup with something a lot more friendly - Lightroom. Although this is nothing more than an inconvenience to most tech heads, Lightroom can be used to extract the pictures from your phone and saved to a specific folder. Step 3 - the Import window opens and you can see in the top left corner of the image above, the device 'David Clapp' is in the list. Step 4 - in the 'Destination' panel on the right hand side, choose a destination location. I chose the root folder 'davidclapp'. Step 5 - Now the important bit - tick the box 'Into Subfolder' and name the folder 'iPhone BKP' or similar. Make sure you do this otherwise Lightrooom will try to put all you images into date ordered folders - a total nightmare. 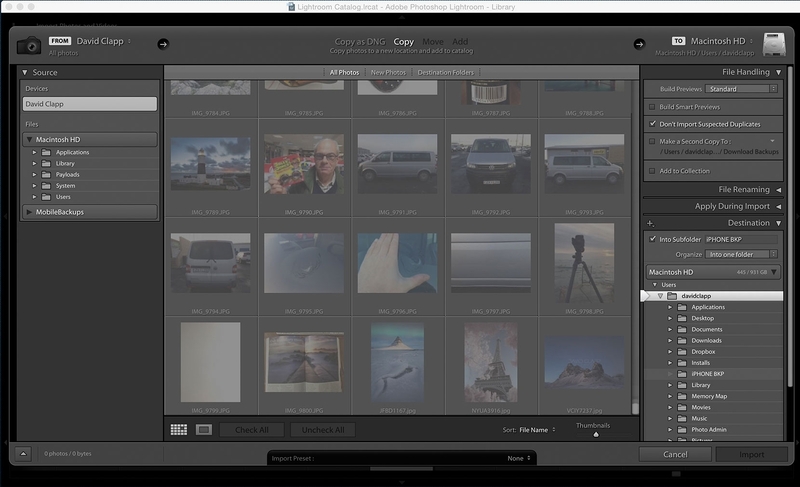 Step 6 - Press the 'Import' button and the pictures and videos will be transfered to your folder. 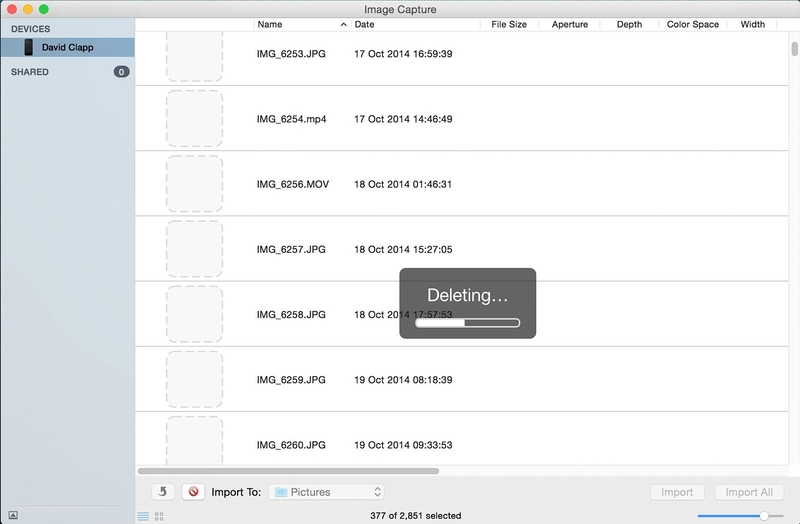 Now you may want to free up some space, so how do you delete the images and videos? The answer is to use Image Capture on the Mac or a similar PC program. Step 7 - Open Image Capture. Your device will be present in the top left corner again. Step 8 - Click on your device and all the pictures will populate a long list. Step 9 - Select the 'No Entry' icon on the bottom left corner and this will delete the iPhone's images completely. It is basically as easy as that. You can then make another simple backup of the iPhone folder without all the hassle of iTunes, which I have done to my server. Browse and edit the folder of images using all the functionality of Lightroom and flag all those slimey meals / Ebay pictures / embarassing moments for permanent deletion.